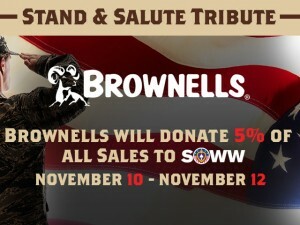 Customers can learn more by visiting the Brownells “Stand & Salute Tribute” page. Special Operations Wounded Warriors (SOWW) is a not-for-profit group that provides outdoor experiences and therapeutic retreats, as well as assistance with medical, physical and mental therapies for both veterans and active-duty members of the Unites States Special Operations Forces who have been wounded in action. For more information, visit http://www.sowwcharity.com. Serious About Firearms Since 1939™, Brownells is the world’s leading source for guns, gun parts and accessories, ammunition, gunsmithing tools and survival gear. With a large selection of both common and hard-to-find items, and an extensive collection of videos, articles, and gun schematics, Brownells is the expert for everything shooting-related. Committed to maintaining our great traditions, Brownells has more, does more and knows more – and guarantees it all, Forever. For more information or to place an order, call 800-741-0015 or visit Brownells.com.